Fresh Jam Radio is for those of you who live for jam bands and appreciate the variety of getting your music through a radio stream. The assortment of artists that the radio pulls from covers everyone, including, Phish, Umfrey’s Mcgee, The Disco Biscuits, U-Melt, Keller Williams, Yonder Mountain, and so on. Once you pull up the Fresh Jam screen you have the option of listening to high band or low band radio. 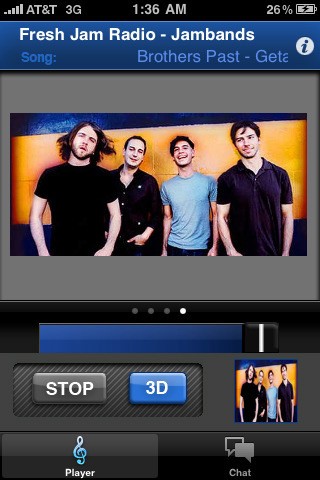 As each song comes on, the app provides you with the name of the band and the song title as well as where they played it, when, and how long it is. There are four different screens, the first is the high or low band option, the second is a list of songs that will be playing, the third is of a tone frequency grid which complements the psychedelic theme of most of the songs, and the last one is the album—or in the case of jam bands, concert—artwork. Along with the player you get a second option to chat with people from all over who are also enjoying the app. You simply enter in a “nickname” and a message next to it and send off. Chatting is a dependable option for people who enjoy this genre of music because a lot of it is obscure and contingent upon concert experience, therefore, if you are looking to listen to a certain set you can ask around. The music continues to play while you chat. The only criticism I have for this app is that you can’t skip songs. If the station is playing something you aren’t particularly fond of, you have to turn it down or off. Although this limits your options, most of the music has the same tempo and murmur so you aren’t jumping from one extreme to another. In other words, having the skip option for this kind of music is not a necessity. Fresh Jam Radio is perfect for grilling out on lazy, lackadaisical afternoons. Most of the songs are at least 20 minutes long and sound so similar to each other that it’s the perfect background music because it just drones on without asking too much of your concentration. If jam bands are your thing, the $2.99 it costs is a steal. AppSafari review of Fresh Jam Radio was written by Vanessa Paszterko on July 11th, 2010 and categorized under App Store, Music, Radio. Page viewed 3880 times, 1 so far today. Need help on using these apps? Please read the Help Page.